So Sunday night Lucy and I went to see green comedian Mark Sampson in his latest show Africa Clockwise at the Masque theatre in Muzenberg. It’s fast paced, rib tickling, enthralling, informative & reflective…a heartfelt and thoroughly entertaining gem. However, it wasn’t always this way! We went to see Mark perform the first incarnation of the show at Noordhoek farm village a year or so ago and he was not as funny, more angry. This is not an unnatural reaction. Mark had been researching a lot for his show and had started to take on the gravity of the environmental and social hole we have been digging for ourselves and the task we have to face to ensure a sustainable future. The difficulty is that when you first start looking the problems seem endless and hopeless. With his two kids futures in his hands Mark decided to try and use his amazing humorous talents to raise awareness about what he had found. However, at that time he was still coming to grips with it all and the frustration and sadness was clear in his previous show. With what we do in icologie I know how this feels and we sat and chatted after the show. For what it’s worth, I shared with him what we’ve learnt about motivating the people around us to change and connect with sustainability. Focusing on the positive, connecting it with our lives, offering solutions, making it real and not just information, a journey of steps and not having to do everything. He’s been working hard on his show and travelling around SA performing it. Now his amazing, quick witted humour is shining through, he’s come to grips with a lot of the issues and is bring sustainability to our world through laughter. 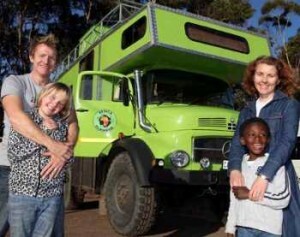 With his wife Sam and his two kids, Mark is planning a clockwise tour of Africa in a green truck powered on Bio Diesel. 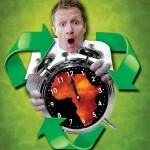 He’s trying to raise awareness of sustainability challenges, but he is also a man on a mission. He’s trying to find some answers for himself and this is his and Sam’s way of exploring a different way of living. Obviously living behind the lentil curtain in Noordhoek was only a start. He assures me that his carbon footprint will be lower travelling with his truck than if he were to be living his normal life style. I think he’s right. What you see is what you get with Mark, no airs and graces just a genuine, honest and bearing all. He’s been through a lot over the past two years and it’s clear to see. Ironically he’s been laid up for a few months with a back injury, which he got lifting a solar panel! His search for a new meaning and securing a future for his family is taking him on an incredible and exciting journey, a journey that will inspire us all. I look forward to him sharing more of his insights with us.